(iv) 56 kilobaud on frequencies above 220 MHz. (2)	When type A2, Fl or F2 emissions are used, the radio or audio frequency shift (the difference between the frequency	for the "mark" signal and that for the "space" signal	as appropriate, shall be less than 900 Hz. (3) When type A2 or F2 emissions are used, the highest fundamental modulating frequency shall be less than 3000 Hz. 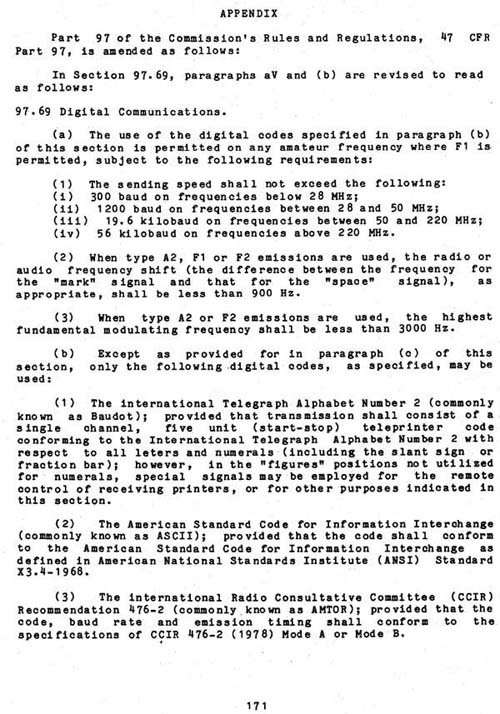 (1) The international Telegraph Alphabet Number 2 (commonly known as Baudot); provided that transmission shall consist of a single channel, five unit (start-stop) teleprinter	code conforming to the International Telegraph Alphabet Number 2 with respect to all letters and numerals (including the slant sign or fraction bar); however, in the "figures" positions not utilized for numerals, special signals may be employed for the remote control of receiving printers, or for other purposes indicated in this section. (2) The American Standard Code for Information Interchange (commonly known as ASCII); provided that the code shall conform to the American Standard Code for Information Interchange as defined in American National Standards Institute (ANSI) Standard X3.4-1968. (3) The international Radio Consultative Committee (CCIR) Recommendation 476-2 (commonly known as AMTOR); provided that the code, baud rate and emission timing shall conform to the specifications of CCIR 476-2 (1978) Mode A or Mode B.